UPDATE 26 September 2012: I reached the summit on my 2nd attempt! Read the story HERE. 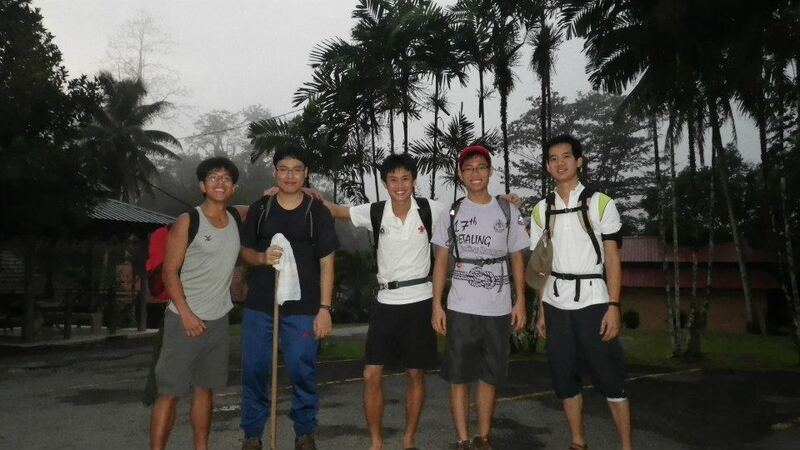 On 17 August 2012, I attempted to climb Gunung Nuang with 4 other friends. Gunung Nuang, the highest mountain in Selangor, is known to be a fairly difficult climb which usually takes a whole day. From the various blog posts I have read on Gunung Nuang, it doesn’t seem to be a particularly fun mountain to climb, being famous for never-ending muddy and slippery slopes, and very few nice views. While the 1493m peak isn’t nearly the highest in Malaysia, the challenge comes from starting at a low altitude of 190m. 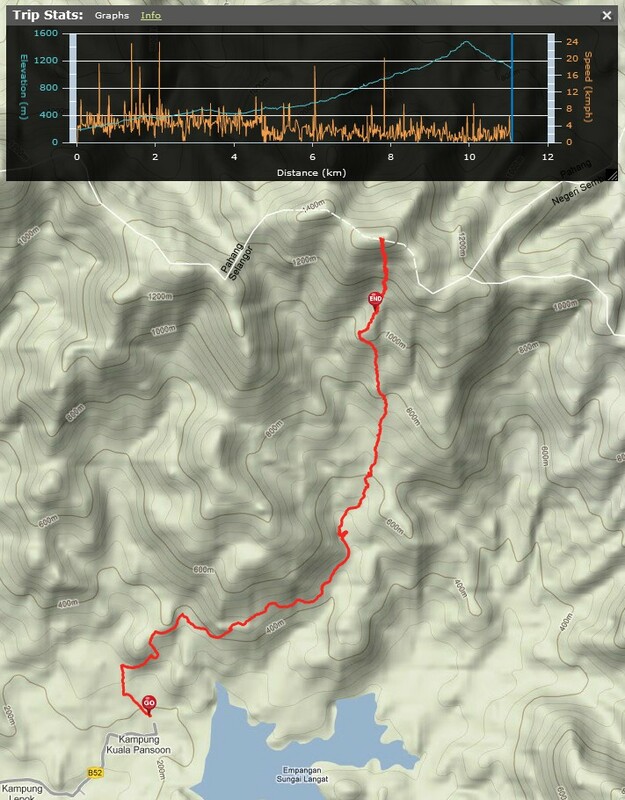 The climb can be separated into a few sections: Start – Never Ending Road – Kem Lolo – Kem Pacat – Puncak Pengasih – Summit. The weather had been rainy for a few days prior to our climb, so we went mentally prepared for leeches and muddy terrain. We left KL around 6am and started our hike just after 7am, as the skies were just starting to turn light. By the time we had hiked for 20 minutes, almost everyone had picked up hitchhikers: leeches. They would become a constant sight throughout the trip, both on the trail and on our legs. By the end, everyone had 5-10 bites, except myself, as I had decent leech protection on. We reached the end of the “never-ending road” at 8.30am (1:15hrs hike) . Unfortunately, we took a wrong turn and ended up crossing the river twice, unnecessarily. The detour cost us almost half an hour, after which we arrived at Kem Lolo @ ~9.15am (~2:00hrs hike). After that, it was a long slippery road to Kem Pacat, which we reached at 11.10am (4:00hrs hike). Unfortunately, due to time constraints (one in our team had to be down by 6pm) and my pace being on the slow side, we realized that we would not make the peak in time to get back by 6pm, so me and a friend stopped at Kem Pacat. The other 3 left any unnecessary items behind and set off for the peak. The 3 other climbers returned to Kem Pacat at 1.40pm, unfortunately not having made it to the top. There had been a fallen tree along the path which took a long time to clear. They reached Puncak Pengasih (~1480m) at ~12.30pm, and decided that they wouldn’t make it in time to the peak for the 6pm return time. Also, water supplies were running slightly low. We all headed down, reaching the entrance just after 5pm. We were defeated by Nuang, mostly because of time constraints. I will be climbing it again, as I know I am capable of reaching the top. For now, Nuang can laugh at us, but we WILL defeat it! There were a ton of leeches. You can leave unneeded supplies at Kem Pacat (1100m) to make your summit attempt easier. Either mark your belongings or leave a few friends there. Collect your supplies on the way down. At the first river, don’t go down the steps to cross the river. Take the trail on the left to follow the big pipe.